The original title for Grand Theft Audio fared poorly in focus groups. Grand Theft Audio is a 2007 video game produced by a small development studio formed within the Recording Industry Association of America. It was designed to educate the player on the implications of illegal filesharing, which the RIAA claims is the cause of up to $4 billion in lost annual revenue for the music industry, and unauthorized tape recordings, to which the association has not attached a monetary amount of lost profits but insists on its website that the practice is "really just not remotely kosher." The original advertisement for Grand Theft Audio shows conspicuous similarities to the poster for the 1931 Western Fair Warning (below). The RIAA first announced the development of Grand Theft Audio in 2005, which, along with the years 1952-88, 1992, 1994-2002 and 2004, the trade group has identified as "critical junctures" in audio intellectual property rights. 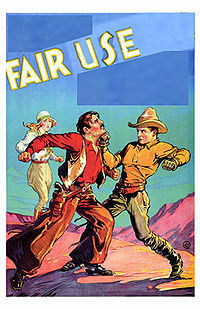 Originally the website set up for the game, gtaudio.com, displayed only a poster of two cowboys in a fistfight with the phrase "FAIR USE" across the top. 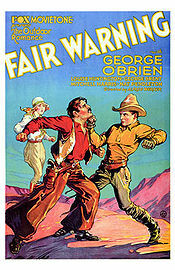 This poster was soon removed after it was discovered that it was actually a manipulated advertisement for the 1931 Western Fair Warning starring George O'Brien, and still under copyright. It was replaced with a text-only "COMING SOON" notice which constituted the site's only content until late 2006. In November 2006 print ads began appearing in many large trade magazines, including Audio World, IP Monthly and RIAA Weekly Office Newsletter. Many movie theaters also ran 30-second spots before popular films, although the organization was criticized for using violent and sexually explicit imagery in ads that were shown before children's fare such as Happy Feet. Former RIAA president Hilary Rosen applauded this measure, claiming that such startling content was necessary if "we wanted to get 'em when they're still young and impressionable." Grand Theft Audio was released for online download January 3, 2007, and accumulated over 100,000 downloads on its first day of availability. Nearly 5000 of these downloads were from gtaudio.com, with BitTorrent and other peer-to-peer programs accounting for the remainder. The website was soon snowed under by claims of a bug in the software that prevented the player from skipping the game's introduction. A preliminary voice loop warning the player that "illegal duplication of any element of this program is subject to legal action" repeated over and over for nearly ten minutes. The RIAA has since claimed this as a purposeful feature and has made no modifications to the code except, via a January 8 patch, to append "...and fines" to the end of the announcement. The overwhelming response to Grand Theft Audio was confusion. Aside from the few thousand players who downloaded the game directly from the gtaudio.com site, most others were under the impression that the game was a legitimate new release by Rockstar Games, the developers of the popular Grand Theft Auto computer and home console games, who were then working on the much-anticipated fourth numbered game in the series. This may be due to the designation of the compressed installation file as "gta4.rar," which the RIAA has claimed was simply an inadvertent coincidence. The organization has not responded to the fact that the text help file for the game makes no mention of the game's full title, referring to it only as "GTA" and, at one point, "Grand Theft Au to make the public aware of the dangers of filesharing," with the "dio" of the title in hidden white text. GTAudio received mixed critical reviews. Some felt that the game was too derivative of Rockstar's Grand Theft Auto series, with PC Gamer claiming that "replacing the lead pipe item with lawsuit papers is simply not enough to keep the game feeling fresh." Others were more positive; in a New York Times review, a critic lauded the game as the "single best filesharing-litigation game with guns of all time." The gameplay combines a nonlinear, sandbox aspect with more restricted courtroom scenes. The majority of GTAudio sets the player in the middle of the mid-size Pirate City, which has become overrun with gangs, pimps and intellectual property violators. The player is encouraged to chart his or her own course in these segments, although to keep the player on track thought bubbles will pop up periodically over the on-screen character's head with messages such as "Hey, it's been a while since I've popped a cap in some P2P punk" and "I think the guy next to me may be listening to a burned CD. Where's my knife?" The RIAA claims that there are over fifty activities possible in the sandbox sequences of GTAudio, all of which affect the game's "Justice Meter" to varying degrees and are rated from one to five Bainwols, defined by the help file as "a unit of measurement denoting one's dedication to protecting our struggling music companies artists." The long arm of justice corrects a wrong done to Ace of Base. Periodically the player will receive a virtual court summons. When this happens he or she can choose to be the prosecutor or defense for an individual accused of audio fileswapping. Currently a fatal error occurs when the "defense" option is chosen, but the RIAA has claimed that they are working to fix the issue. The courtroom sequences are primarily text-based: the player makes decisions on what to say to the accused fileswapper, and the outcome of the case depends on the eloquence and forcefulness of the player's arguments. "I find you GUILTY of stealing Vanilla Ice's intellectual property and financial security, you wretch!" "You should be ashamed of further compounding Beyonce's hardships! You are nothing but a scum-sucking anarchist! Clemency DENIED!" Despite the cosmetic differences between the prosecutor's claims, they invariably result in the defendant's being incarcerated, and sometimes tortured. Less than forty-eight hours from the release of GTAudio, an internet hacker released instructions for how to open a hidden sequence of the game. 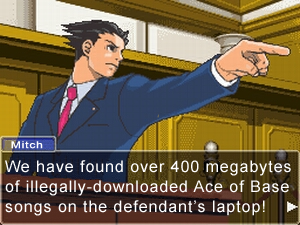 The unearthed segment, encoded within a file named hotdrm.bat, featured a playable scene in which the player could strip a compact disc of DRM restrictions, slowly tease out a digital audio file containing the CD recording, and thrust the recording out into the ether of the internet for others to enjoy. The rising excitement of the scene climaxes in the recording's release as a BitTorrent file, after which the on-screen character smokes a celebratory cigarette. The RIAA initially claimed that the hidden sequence was an unauthorized addition by a disgruntled coder. 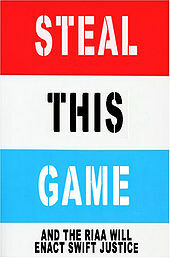 After downloads of the game tripled within two hours of the revelation of hotdrm, however, the RIAA retracted its original statement and released a replacement that gave the organization full credit for the hidden scene, albeit it with the claim that its intention had been to "draw a parallel from the carcinogenic properties of tobacco to the dangers of the removal of Digital Rights Management measures." The RIAA has already announced plans to port GTAudio to the Xbox 360 and PSP, and has commenced work on a full sequel for the PS3. Tentatively entitled "Grand Theft Audio: Price City," it will be a radical departure from the structure of the original game. Players will control an upstart music label and have to make decisions about the content and pricing of their product and how to manage their artists' intellectual property. Early reports reveal that good decisions regarding IP will be rewarded with "Integrity Points." Players who make what the RIAA considers "poor" decisions about intellectual property will be referred to their local law enforcement agency. Grand Theft Audio is part of Uncyclopedia's series on Mass Media. This page was last edited on 8 June 2017, at 02:56.